The offseason is the time to work on new skills and discover ways to improve your game. Growing up, I was fortunate enough to be around some of the best players and coaches in the area. The local camps that my friends and I attended taught us to think outside the box and find creative ways to play. We were never told that we can’t do this or that and constantly experimented with ways to do things better. This approach provided me the opportunity to grow as a player. Later on at the Division 1 level and also the MLL, the unique skills and philosophy that were encouraged back in my camp days helped me to succeed against the best players in the world. 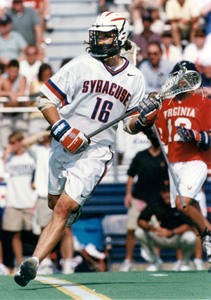 Ultimate Orange Lacrosse was created with these learning basics and fundamentals in mind. By attending Ultimate Orange Lacrosse Camp, players will learn the most important skills necessary to be successful in the sport of lacrosse. We provide a positive learning environment that encourages young players to take chances without the fear of making mistakes. Registration is now open for our 2013 Summer camp in Danbury, CT for boys grades 1-8. Click here to download our registration form.